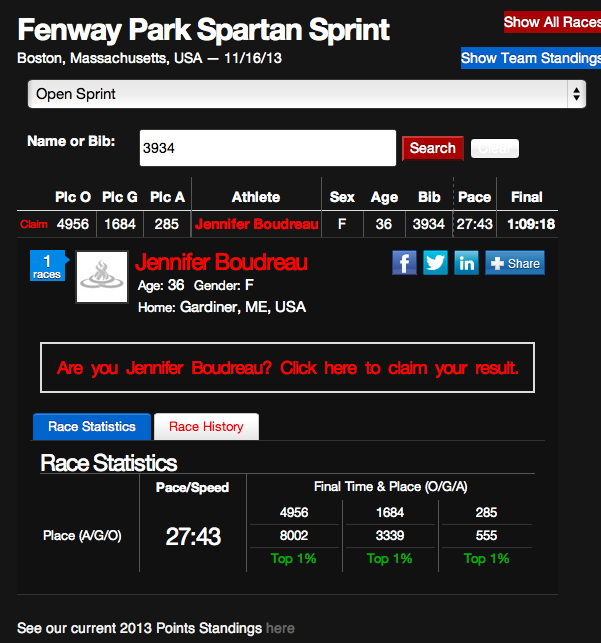 Now that I am finally recovered from Spartan Fenway, it's time to reflect on this amazing experience. This was definitely a team effort and I could not have done it without any of the Rail Trail Chicks. Stacy, Carrie, Jill, Karen and myself left afterwork on Friday, had a delicious dinner in Freeport and then headed off to Boston! We were in the 9:30 start time. It was suggested we get to Fenway around 8 am to get our bibs and headbands. We ate a light breakfast at the hotel, checked out and drove to the nearest T station. Upon getting to the T station, I was starting to feel a bit of panic. What the heck was I thinking? So I snapped this picture and sent it to Ward. I only got a LOL in response. Not even a supportive response. Just LOL. Nice. a much better picture - instead of the freak out above…. We arrived at the park a little after 8, so we went directly to the check in area, got our bibs, bracelets, timing chips, and headbands. After we put on all of the various bracelets and our headband, we headed off to entrance to Fenway. I'm still not sure why there was a bib number and safety pins in the packet. The headbands had our numbers on them. We were directed to not wear the bibs. So why were they in there? Oh well. On our way to the entrance, I had a quick hug from the famous Jill. Then she was off to meet up with her team. Once we got into the stadium, we walked around a bit, took a few pictures, then went to the stands to check out the course. We were able to watch the big screen to see some of the obstacles we were about to encounter. It was cloudy and rather chilly at this point. I had chosen to wear my arm sleeves with Spandits tank top, and was regretting it at this point. I was cold! I almost wore my Reebok jacket (pictured above) but didn't want to risk overheating and then losing that along the course somewhere or having to tie it around my waste. However, I'd like to report that the tank top was a great idea because not too far into the race, I was stripping off the arm sleeves and the gray cloudy day was gone and replaced by a gorgeous blue sky. We decided to head to the starting line a bit early, which is a good thing, because they were backed up a little. 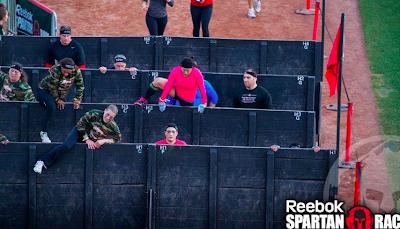 Before we even got to the starting line, we had to get over a 6 foot wall. Thankfully we could help each other out because I'd still be trying to get over the wall. This was not the actual wall, but it was the same height. I was hoping this was the only wall, but I was VERY wrong. There were about 10 more of those along the course. At least. I could be off. I lost count. Finally we got to the front of the line. We were directed to do 10 burpees and then after a short pause, we were off. The girls and I stuck together throughout the entire course. Thank goodness we did because we helped each other get through some difficult situations. To sum up the course, bleachers, a lot of them. Up and down, between the rows. Walls. Several 6 foot walls, one 8 foot wall. (I needed help on every single wall and I have the bruises to prove it.) Rope climb (women had knots), rowing machine, traverse wall, spear throw, weighted jump rope, hopping stairs with a thick rubber band around ankles - I think it was called the bunny hop?, walking bleachers with a large (5 gallons of water maybe), walking bleachers with a 25 lb sack (which seems like nothing after carrying a 40+ lb toddler up and down the stairs at home, box jumps. I am sure I left out quite a few (blocking out perhaps) obstacles, but you get the drift. I'd say the easiest part of the entire course was the bleachers. And then afterwards, my legs felt fantastic. The hardest part? The monkey bar part….. I tried one. Hung there for a moment, then said screw it and jumped down and headed over to the burpee section. There were a few obstacles I could not complete, which was okay with me. I just did the burpees. Then finally, after an 1:09 minutes, we finished. Just as we started, as a team. We did it! We are Spartans! One major accomplishment right here. And the medal rocks. This is the back side, which is my favorite side of the medal. Pretty awesome to have been all over Fenway, home of the 2013 World Series Champions! After we finished, we headed out very quickly because we were starving. We had a nice lunch at a local bistro, then stopped at Starbucks for a nice reward, then headed straight to the T. We completely forgot to get a finisher photo of all of us. We are bad. But here are a few…..from the T.
and then Karen. Looking all badass. As usual. She is a tough woman! The soreness kind of crept on Sunday. But then Monday came and I was in pain. A lot of pain. My shoulders, ribs, back muscles. Ouch! But never my legs. I didn't realize I had any bruises until one of my students said "Mrs. Boudreau, what's wrong with your arm?" Ouch! So then later on I did an inspection and found dark, rather painful looking bruises inside my legs on both sides. That is what happens when you have to get over all of those walls. But you know what? I had a great time. I accomplished something huge for me. And I want to do another one. Yes, that's right! I see another Spartan in my future. And more and improved upper body strength training beforehand. And then here's the kickass finishers shirt. I really do like it and have worn it several times already. Oh and this cute little girl thinks it's absolutely awesome that her mommy is a Spartan! If you really want to see a great Spartan show and follow some real life Spartan athletes, you should watch the Spartan Beast World Championship on NBC Sports on December 7th. If you'd like to do any 2013-2014 Spartan Race in the continental US, you can get 15% off here. OR you can enter for your chance to win an entry below. I will choose a winner next Wednesday, 11/27/13 and announce it on blog. I want to be a Spartan because it looks like a challenge and so much fun. I want to be a Spartan because it looks like something that will challenge me. I do not want to be a spartan (unless of course hubby is prepared to fly me out for it ;-)) but I love the team element of the event. WELL DONE LADIES. I have always wanted to try it to see if i can do it. I want to be a Spartan because my wife and I love doing races together. I would like to work at a Tri-fecta! And what better way than to run Spartan Races! AROO!!! Because I'm a glutton for punishment and need to do that again! So much fun to accomplish a race with friends! I want to prove to everyone that I can do it! I want to win because I ran the Fenway race and want to do it again in 2014!